Hello Everyone! Thanks for all the wonderful comments on the camera box I created for The Cutting Cafe design team blog hop last week! As I mentioned, I am giving the Camera Treat Cup Card and Keepsake Box Cutting File and Template file to one person who left a comment letting me know why they liked the file and how they would use it, and they had to follow/subscribe to my blog. In the old fashion, put the names on pieces of folded paper, mix them up, and pick one method, I chose a winner. Congratulations to Janja65 who said: I like the design paper you’ve used for the camera, its beautiful! I would love to make this camera box with a mini album for a friend who is pregnant with a baby girl ❤. Leave a comment below letting me know you saw this and I will email you the file. Thanks again to everyone who stopped by! Here is the box with the top off. 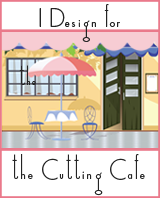 Make sure to visit The Cutting Cafe Blog on the 7th and the 21st of every month as those are design team post days. On each post date, a random name is chosen from the comments to receive three free files from The Cutting Cafe. So be sure to comment whenever you check out one of the design team posts! It’s a Cutting Cafe Blog Hop! We are doing a blog hop at the Cutting Cafe! You should begin the blog with Regina, the owner at her Blog, Hand to Paper. And, if you are following along, you should have come to my blog from Tmika, who is Scrapdaworld on her blog and on Scrapdaworld YouTube Channel. Each design team member got to choose the file they wanted to use and you have a chance to win! Each design team member is giving away the file that they used. You must follow their requirements to win. I used the Assorted Purse Box Template which is a versatile file featuring so many options. There are five purse styles with multiple options such as background paper, different handles, tags and sentiments, and more! Tell me what you like about The Cutting Cafe files if you use them or what you think you will like if you haven’t used them. I will pull a winner on Sunday, September 10 after 5:00 p.m. Central. Remember that we post our projects on the 7th and 21st of every month on the Cutting Cafe Blog. Leave a comment and you can win three free files of your choice if your name is drawn from the comment! The Cutting Cafe is 5 Years Old and is Having an Awesome Giveaway! Happy 5th anniversary to The Cutting Cafe! In honor of this milestone, the owner, Regina, is having an awesome giveaway. If you want to win all the new files released for the next four months then see all the details here, or click on the logo above! Hurry! You must leave a comment by 11:59 p.m. on Sunday, January 5th! Good luck!